It only takes one family member to tarnish the family name: a certain Baron Karl Hieronymus von Münchhausen is known to the world as a pathological liar. However, there’s another baron born two centuries earlier, Hilmar von Münchhausen (1512-1573), who is known to history as a famous mercenary leader—and the builder of this castle hotel. It wasn’t until the end of his military career that von Münchhausen had time for the pursuits of the landed aristocracy. The foundation and moat for this castle were laid in 1570. Probably the most famous visitor was Tsar Peter the Great in 1715, who was fascinated with the estate’s enormous collection of plants and a pineapple plantation in the orangery. The castle changed ownership over the years, and in 1992 a fire devastated one wing. In 2004, it began its new life as a five-star hotel. You don’t want to come all this way to stay in the tithe barn. Splurge a little and opt for a room inside the castle. Also, you might want to wear your better clothes around the property. 66 rooms and suites (half of the rooms are located in an outlying building). The hotel is located about 15 km southwest of Hameln. Yes. Chapel on site. Inquire the hotel for more details. 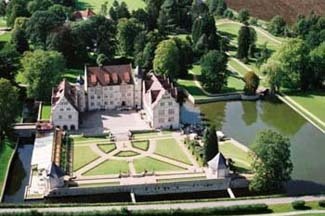 Just off the Märchenstrasse or Fairy-Tale Road is this moated Renaissance castle. Surrounded by the Weserbergland Schaumburg-Hameln Nature Park, the atmosphere here is quiet and sedate. You’ll find half the guest rooms in the historic castle and the other half in a remodeled tithe barn just across the way and connected with each other by a underground passage. Guest rooms inside the castle are very clean, handsomely furnished, and highlighted by an occasional antique piece. The rooms in the tithe barn are more modern in decor. All bathrooms are modern, and some have free-standing bathtubs. One of the more impressive public rooms in the castle is the Rittersaal, or Knights Hall, which features a soaring ceiling and fireplace you can pull a chair up in front of. Two restaurants offer either German specialties or French cuisine, the latter served in one of the historic Renaissance rooms. If you’re with a group, the 400-year-old, double-arched castle cellar is available.